Since the 1980s, innovative exterior wall systems have been developed to enhance building appearance and improve overall performance of a facade. In recent times, an increasing number of fast-moving fires involving cladding have occurred on high-rise buildings, including structures in Dubai, Shanghai, Atlantic City, and London. NFPA has developed research and resources to help building owners and global enforcement authorities assess the fire risk of existing high-rise building portfolios, as well as identify what fire test procedures to apply when designing new buildings. For existing structures: NFPA resources, including research methodology and interactive online tool (EFFECT™) to help building owners, facility managers, and AHJsevaluate existing high rise buildings with combustible exterior wall systems. For new construction: NFPA resources, including an interactive online tool to help architects and engineers in the United States identify what fire test procedures are mandated when new wall systems are being designed. NFPA sponsored facade fire risk assessment research by project consultant Arup, and then developed a tool for Authorities Having Jurisdiction (AHJs) to address hazards in high-rise buildings. The research and tool, created by NFPA and project consultant ARUP, details how AHJs can use both resources to prioritize buildings in their jurisdiction, conduct initial fire risk assessments of each building, and identify those building that have the highest priority for inspection. Sign-in or register to use EFFECT. Video: Watch 2-minute overview of how you can apply EFFECT™. Video: NFPA's Brigitte Messerschmidt discusses new research to assess fire risks in high-rise buildings with combustible exterior wall assemblies, and a new tool (EFFECT™)to help those responsible for prioritizing and remediating hazards. NFPA has developed a free interactive tool to help navigate the code requirements that apply to exterior walls containing combustible components. 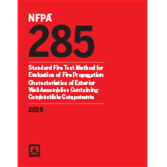 It also helps determine when those requirements apply for testing to NFPA 285,Standard Fire Test Method for Evaluation of Fire Propagation Characteristics of Exterior Non-Load-Bearing Wall Assemblies Containing Combustible Components. Requirements within the tool are based on the 2015 edition ofNFPA 5000,Building Construction and Safety Code, and the 2015International Building Code. Sign-in or register to use the Decoding Exterior Wall Requirement tool. Fact sheet on the fire hazards of combustible exterior walls. Video: Watch a demonstration of the Decoding Exterior Wall Requirement tool in action. London Calling (NFPA Journal®, Sept/Oct 2017): Experts say the problems that led to the deadly Grenfell Tower fire in Great Britain may exist in thousands of buildings around the world. NFPA is developing an array of resources to address issues related to combustible exterior wall assemblies. The System is Broken (June 2017): NFPA President Jim Pauley looks at why the deadly London fire and other events at home and abroad require a worldwide call to action. Skin Deep (NFPA Journal®, May/June 2016): Exterior facade fires become an increasingly worrisome international problem. Much work remains to create mitigation strategies for planned and existing buildings utilizing these assemblies. Video: Watch as the Address hotel in Dubai goes up in flames on New Year’s Eve 2015. Report: Fire Hazards of Exterior Wall Assemblies Containing Combustible Components (June 2014): Many combustible materials are used today in commercial wall assemblies to improve energy performance, reduce water and air infiltration, and allow for aesthetic design flexibility. This Fire Protection Research Foundation report looks at combustible exterior wall systems in common use, existing research and mechanisms of fire spread, fire statistics, fire incident case studies, and test methods and regulations. High-rise building safety: High-rise buildings present several unique challenges not found in traditional low-rise buildings; longer egress times and distance, evacuation strategies, fire department accessibility, smoke movement and fire control. Reference NFPA 285 for up-to-date fire testing criteria for evaluating wall assemblies. 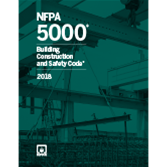 Address today's hazards with NFPA 5000®: Building Construction and Safety Code®.